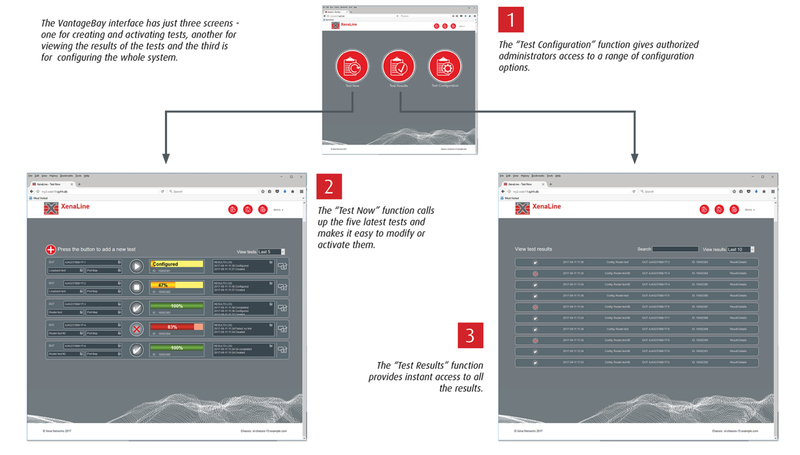 Vantage is a production line test solution for networking devices that use Ethernet traffic, such as switches, NICs, routers, GPON devices, cable modems, EOC, power modems and so on. The solution consists of dedicated hardware and software from an experienced test & measurement expert, and is designed to be flexible, scalable and very easy to use. 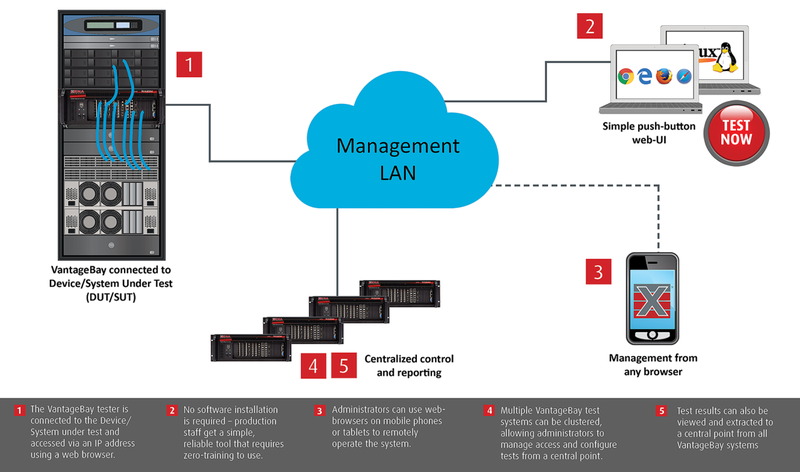 Vantage helps Networking Equipment Manufacturers (NEMs) quickly detect performance issues and verify new features before the Devices Under Test (DUTs) leave the factory. This small investment in pre-production testing and quality assurance improves customer satisfaction and productivity. Vantage is all about ease-of-use. User-friendly software gives quick access to powerful automation features that make it simple for production-line staff to conduct comprehensive testing with just a few minutes instruction – one click of a button is enough to execute complex sequences of testing and report generation. How does Vantage compare to Valkyrie? Vantage delivers a simple Pass/Failure result mechanism. Valkyrie provides comprehensive results that are much more detailed for further analysis. Vantage is used for production line testing - most functions and configurations are pre-defined, and repeated in very short test duration. Valkyrie is used for a huge range of test scenarios and supports complex configurations and extended testing. 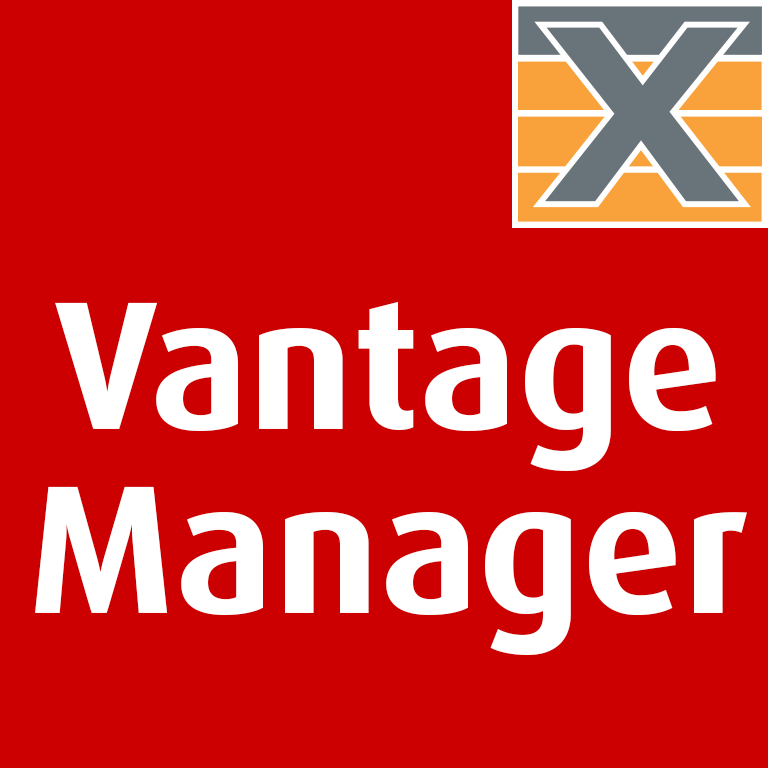 Vantage hardware is controlled via an easy-to-use web-interface called VantageManager. VantageManager works with any web browser and requires no understanding of network or testing to operate. A selection of pre-defined testcase is available and new testcases can be developed by Xena’s team of engineers. 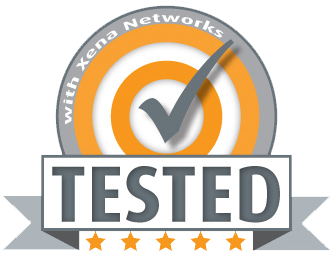 The testcases can be configured and combined by Xena’s engineers or customers to meet individual needs. The software automatically generates reports documenting the tests. These are clearly laid out with the front page summarized DUT ports with pass/fail mechanisms, and a list of failed ports that have failed with probable causes indicated. More details are then presented later in the report if there is a need for in-depth test analysis. Router test Bi-directional traffic generation between WAN and LAN ports, could be multiple LAN ports to single WAN port, or one WAN port to multiple LAN ports. Test of throughput and failures. The test may be configured with values for packet size, bandwidth, packet loss and other stream parameters. The result of the test is a pass/fail message and in the case of fail details about the failure for later analysis. Two-way interaction test Generate traffic between all ports, or between odd and even ports, or one direction traffic generation, with or without VLAN tagged frames. The result of the test is a pass/fail message and in the case of fail details about the failure for later analysis. Aggregation test Supports one-to-many and many-to-one traffic generation. Loopback test Loopback test one a configurable number of ports on e.g. a DUT such as a switch or a router. The test may be configured with values for packet size, bandwidth, packet loss and other stream parameters. The result of the test is a pass/fail message and in the case of fail details about the failure for later analysis. PON aggregation test Traffic is transmitted one-to-many and packets are sent both up and downlink. The test may be configured with values for packet size, bandwidth, packet loss and other stream parameters. The result of the test is a pass/fail message and in the case of fail details about the failure for later analysis. Vantage solutions are available in 2 chassis: the fixed 1U VantageCompact chassis – there are 4 versions supporting testing from 1GE to 100GE. Alternatively, choose the modular, high-port density 4U VantageBay chassis with 12 slots for test modules supporting speeds from 1GE up to 400GE via a variety of interfaces: SFP, SFP+, QSFP, QSFP28, QSFP56 & RJ45. Vantage has dedicated production-only test modules that can be ordered and installed in any combination. The robust chassis features a very strong mounting mechanism for the test modules. This ensures high levels of reliability in demanding production environments and during transportation. 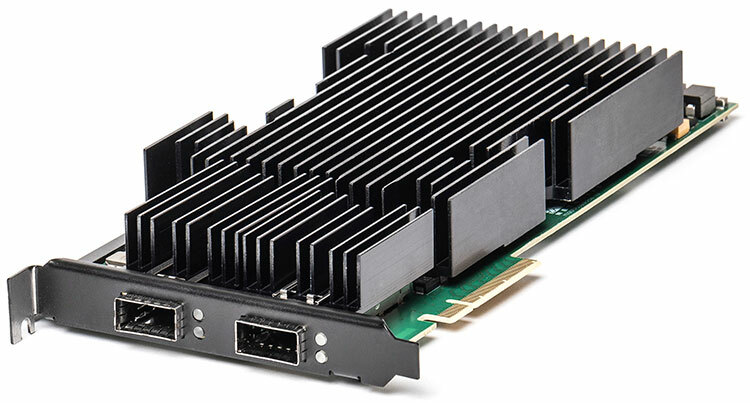 The “7-speed” Van-400G-7S-1P supports testing at 400G, 200G, 100GE, 50GE, 40GE, 25GE and 10GE. Not only can you test the 400Gbps equipment, you can also save money by testing six other speeds using the same test module.